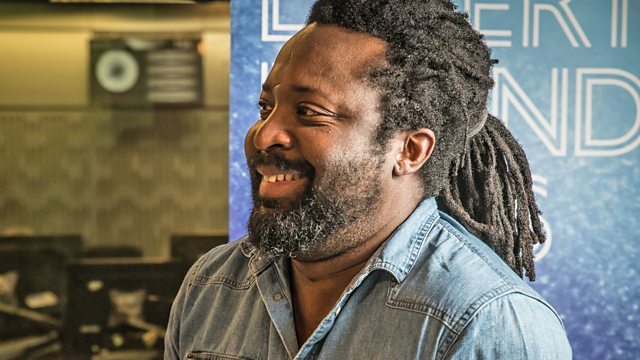 Marlon James, writer, shares the eight tracks, book and luxury he would take to a desert island. With Lauren Laverne. Marlon James is a writer who won the Man Booker Prize in 2015 for A Brief History of Seven Killings, a novel which centres on an attempt to assassinate Bob Marley. Marlon was the first Jamaican to win the Prize. He was born in Kingston in 1970 and grew up in suburbia. His mother worked as a detective, and his father was lawyer, leading to a family joke that his mum locked criminals up and his dad got them out. As a self-confessed geek, Marlon did not enjoy his time at school, and even pretended that he was not related to his older brother, a fellow pupil, because he thought his lack of cool would embarrass his sibling. After studying English at the University of the West Indies, he worked in advertising as a copywriter. His first novel was rejected 78 times, and he thought he had destroyed every copy of it, until he met novelist Kaylie Jones at a writing workshop and she insisted on seeing it. She showed it to her publisher and his career was launched. The book, John Crow's Devil, was published in 2005. His fourth novel, Black Leopard, Red Wolf, the first of a fantasy trilogy, was published earlier this year. Marlon lives in the United States, where he teaches Creative Writing at Macalester College in Minnesota. What did the Jamaican novelist tell Lauren Laverne?